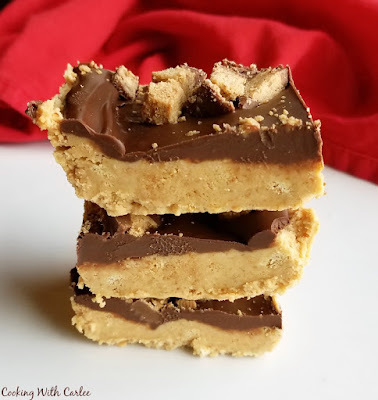 Peanut butter, graham crackers and chocolate come together in a fun no bake bar. These fun treats are sure to get rave reviews everywhere you take them. They are so easy to put together they are likely to become your new go to dessert! Our love affair with these deliciously easy treats started last summer. We were at my aunt and uncle's for a summer BBQ. My cousin Emily is known for her cupcakes and sweets, so she was the dessert committee and her parents handled dinner. Now our affinity for chocolate and peanut butter is well documented. Whether they appear together in ice cream or sheet cakes, we love it all! So it shouldn't strike you as a giant surprise when you hear that we were immediately drawn to these over the other offerings. In fact, my husband kept going back for more. Apparently everyone took notice because they sent him home with a plate of them. It was one of those take these to save us from eating them deals, the kind I do all of the time. Now sometimes he will have satisfied his sweet tooth for the month on his first binge and then the rest sits around until little dude and I eat it or I find it in the garage a month later and throw it away. That was not the case with these! No way! They quickly disappeared. So of course I had to get the recipe. But then the weather cooled off and it seemed like the summer was the right time to share a quick, easy, no-bake treat like these. Finally the time seemed right and I whipped up a batch. You guys, these are so easy, like dangerously easy. They are also so good, definitely dangerously good! They only take a few minutes to make. In the heat of summer, I would recommend letting them firm up in the refrigerator for a bit before slicing. But that is the hardest part, the waiting! Of course we shared these at a family dinner. My husband again helped himself to two big hunks. Then we brought some to share at his mom's where they got rave reviews. I sent the rest out to the garage refrigerator to keep myself from eating them. My husband was nice enough to share with a buddy who put them in his top three desserts of all time! Now that's really saying something! If you love peanut butter and chocolate treats as much as we do, these are a perfect treat. What are your favorite chocolate and peanut butter recipes? Beat together 1 1/4 cups of peanut butter and the butter until smooth. You can use graham cracker crumbs if you'd like, just add them at this stage. Rather than make crumbs, I took it easy on myself and just roughly broke up the graham crackers and let the mixer do the rest. I added in the pieces a few at a time while the mixer was going and the beater broke them up further. Once the graham crackers are all added, mix in the powdered sugar and vanilla. The mixture may look slightly crumbly in the mixer but it will come together. Dump the peanut butter mixture into a lightly greased 9x13" pan and press to form a cohesive layer of peanut butter. In a small saucepan, melt together the remaining 3/4 cup peanut butter and chocolate chips over the lowest possible heat setting. Be sure to stir continuously so as to not scorch the chocolate. Once the chocolate mixture is smooth, spread over the peanut butter layer. 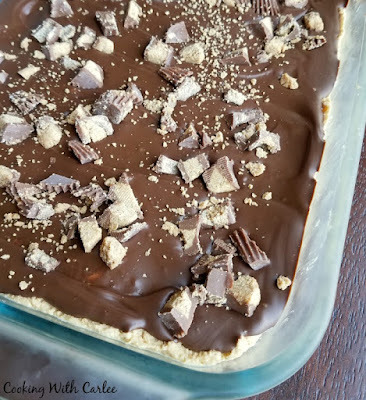 Top with chopped peanut butter cups and refrigerate until set. They are the easiest to cut and serve while still slightly chilled, but should still serve easily at room temperature. They will get soft in the summer heat but still taste amazing! I've seen bars like these before (recipes for them) but have never tried them. After reading your post, I think I better wait to make them when I have somewhere to take them! :) I definitely will try this out. I've always been intrigued by how it would be with the graham crackers! They are sooooo good and definitely something nice and simple to be able to whip up. Everyone we shared them with fell in love instantly. I had my fingers crossed a bit because I was too lazy to wash the food processor, but they turned out great! I am definitely doing it that way every time from now on! These are sure to be a new go-to family favorite! Clearly, whipping up yummy desserts runs in the family! Cousin Emily did real good and I can see my husband and boys gobbling these up in like 2.2 seconds with their love of PB!!! The boys would looooove these and they are so easy to make too! Definitely make some for them soon. You won't even have to tell them how easy they are to make, just let them shower you in compliments! These look so yummy! Chocolate and peanut butter are so good together! And these are no bake :D! What's not to love!! They are so simple but sooooo good! Thanks, Deepika! Thank you! It is definitely one of our favorite combinations too! 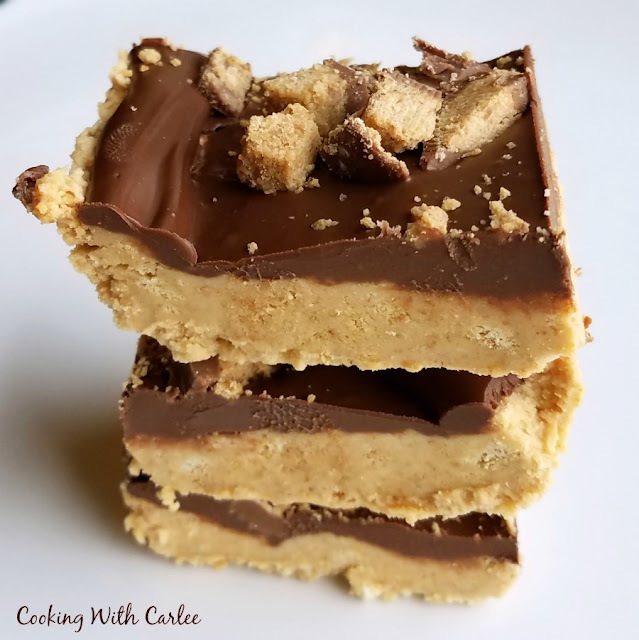 It is impossible to go wrong with peanut butter bars. It sounds like you had a fun family outing. I totally relate to putting them in the freezer in the garage to keep myself from eating too many! Thank you for sharing the recipe. I am pinning and sharing this one. Thank you so much, Amy! Sometimes you have to fool yourself when there is so much good food around! Wow. These butter bars look really perfect and I hope that following your recipe and tutorial, I will be able to make it for my family. WHAT is this deliciousness? Graham crackers, chocolate, and peanut butter are like my three favorite foods. I'm going to try to forget about this recipe until the next time I have a houseful of people to help me eat them :). Have a great weekend, Carly! It's hard to keep from cutting just a little bite more, so definitely wait for company!! These are so simple but so good. Have a wonderful weekend! Ha! How funny that the Swedish Fish go second. I can't say I've tried one in years and now I feel like I should. These would definitely be a hit at your office! It's hard to beat a combination of chocolate and peanut butter! These bars look delicious. I can see why they go fast when served! Thanks for sharing at Snickerdoodle, Carlee! This is the Most Clicked Feature at today's party. It's featured in our party email and all of the co-hosts will be featuring it. I agree completely! Chocolate and peanut butter belong together. Thank you so much for the feature and the party! I love the flavors of chocolate and peanut butter together. Plus it is an easy recipe so how can you go wrong? Easy and delicious is always a winning combination (just like chocolate and peanut butter!) Thanks, Debra! I make a similar recipe at christmas.. but maybe it's time to pull it now??? Yummo! Thanks for the great recipe on #celebrate365! It's never too early! Besides no bake is perfect for this heat! One of my all time favorite treats!